Just in case you haven’t heard enough about Off-White this week, here’s another article. According to Nike, Virgil Abloh’s ten-sneaker project with the brand was one of its fastest ever, with the collaboration going from idea to retail in just ten months. Ten months for the ten – sounds perfect. It’s all part of Nike’s push to reduce production times from 18 months to just 4 over the next three years. But as quick as the Off-White process went for Nike this time around, it may not always be as efficient. You can’t always rush the creative process. As any designer knows that there’s always continual changes along the way. tweaks and adjustments as samples arrive and get sent back until the perfect product arrives. And some of those original samples were unveiled during the week at Harvard’s Graduate School of Design. Virgil Abloh – the mastermind behind the Off-White brand – showcased some of the samples from the pack, as well as images from early on in his design process. 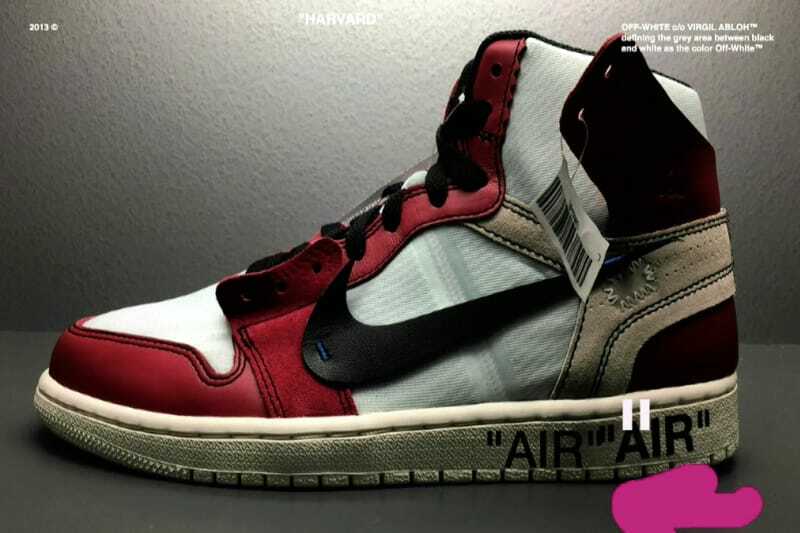 These included his first version of the Off-White x Air Jordan 1 design and never-before-seen pair of Air Force 1’s. And if you can’t get enough of the collaboration, Nike confirmed last week that it will release fresh new colorways of his designs in the second half of 2018.